Happy 4th of July! Need an easy, fast salad to bring to BBQ?! Well, this is it! Now, it may not be the prettiest or most colorful salad on the block but it has great flavor and is not something that everyone else will bring. Cook pasta according directions on package, drain and cool. 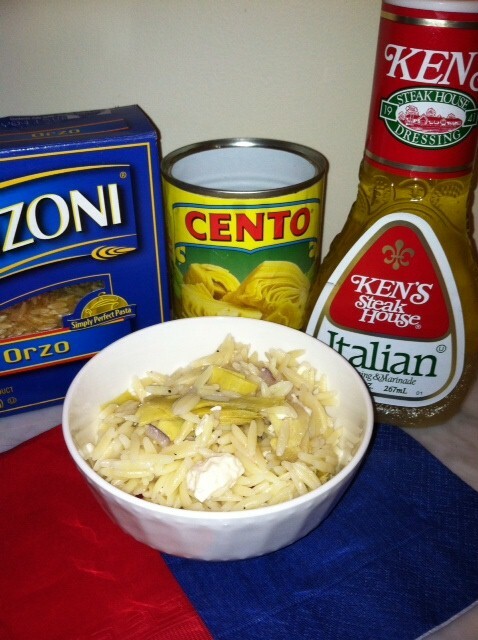 Mix the rest of the ingredients in with the pasta in a large bowl. Chill and eat!!! Have a safe and happy holiday! *You could certainly add some chopped black olives for some more color but I’m not a fan.